The word ‘Silicon Valley’ reverberates through the entire world as a synonym to the most business friendly environment! So what characteristics of a city shortlists one into being considered as one of the most sophisticated and convenient places to set up your business? Is it the number of research organizations/universities or the already established and thriving companies? Many studies provide evidence supporting the claim of existing successful companies which apart from putting the city on the map, also encourage the government to pull fewer strings in the market environment. The alternate story is where the absence of governmental supervision can in the long-run damage the prosperity of a company itself. Some exclusive policies which may prove detrimental to a tech or manufacturing-centred businesses consequently beg the need for more inclusive policies which are more accommodative of new industries. Criteria applied while measuring the ease of setting businesses are the availability of staff and their skill set, unemployment rates, friendliness in acquiring licenses and tax regulations. Austin has consistently ranked on the top as the friendliest for small businesses. What is so special about Austin that makes it a clear standout and is among the top 3 in the several studies conducted? Over the years, the government of Texas has shown lesser inference in markets which are measured under the criteria of Health and Safety, Licensing Requirements, Tax Regulations, Environmental Rules, and Labor Regulations. At 35%, Tax regulations were considered 9% more friendly than the national average and ranks the highest of all states with Licensing Requirements. With the Environmental rules, it has been found that 17% of the businesses found it unfriendly while the national average for the same was 15%. Austin is also known to provide extensive training and networking programs. Also as of 2015, Texas was home to 2.412 million small businesses hence accounting for most of the employment opportunities in the State – with Austin contributing the most. Due to the recently witnessed boom, its unemployment rate is as low as 3.1%, and the rent for commercial spaces has shot up by 30%. Provo, an emerging hub for startups and businesses has attracted attention for all the good reasons. From being one of the best places to raise a family and also one of the healthiest places to live, it has always found its place in the Top 10 of all surveys. One of such surveys, conducted on behalf of the U.S Chamber of Commerce Foundation, Praxis Strategy Group has conducted a survey on methodologies involving Economic Performance, Transportation and Trade, Innovation and Entrepreneurship, Business Climate, Talent Pipeline, and High-tech Performance. Be it business centered on STEM or a public-private collaborative set-up, the Utah government has come up with new, exciting and innovative policies and incentives to attract businesses. Governor of Utah, Gary H. Herbert, in collaboration with Goldman Sachs announced the initiative named, 10,000 Small Businesses to help create jobs and increase economic growth. Another initiative linked with imparting education on ethics in business is the Daniels Fund Ethics Initiative. All of these aim to make Utah the next hub of Startup Culture steeped in quality-rich ideas for businesses. Utah, with an unemployment rate of 3.9% and a job growth rate of 4% has proved itself to be one of the best places in America to start a business. The results do not necessarily point to the quantity but has also been found to have fared well in terms of quality of business ideas and innovation. With a record for highest number of bachelors in the city, Washington D.C isn’t all about politics but provides a wide array of opportunities even to students in the STEM (Science, Technology, Engineering, Mathematics) avenues. Impact Washington, a highly successful NGO aims to empower and strengthen manufacturers to make them globally competitive. A support in the form of expert advice and networking opportunities can really work wonders for a startup looking for investors or customers. As long as NGO’s like these constantly work to keep the network connected, and to help you with business registration, there is always a better chance at taking your business to bigger heights. Also, organizations help influence policy decisions in the state – one of the successful policies being, Washington Economic Development Finance Authority’s Industrial Revenue Bond Program. Unlike other cities, which function as part of the state, Washington D.C is a federal state which provides the benefit of a healthy and steady economy, thus contributing to an altogether business friendly environment. Although Washington D.C lacks universal consensus on its business-friendly nature, it ranks an overall B- in the Thumbtack small business friendly survey, computed based on the ratings of the existing businesses in the city. The Government in Maryland is known to be very supportive of policies that are business friendly, the examples of which are rolling out of exclusive department under Governor Hogan’s stewardship called, the Office of The Secretary of Commerce. He also renamed the department of Business and Economic Development into Department of Economic Competitiveness and Commerce. Maryland Technology Development Corporation (one of the organizations formed by the government to assist entrepreneurs in commercialization of research work, and also providing funds like, Technology Commercialization Fund (TCF), CyberSecurity Investment Fund (CIF), which together contribute to offering 225,000 US dollars, single-mindedly aiming at bringing more entrepreneurs into the market scene. It also works to protect labor laws and healthcare system, the backbone of which is the BioHealth Innovation (BHI). Other indispensable resources for an aspiring entrepreneur would be the Maryland Entrepreneurs Resource List, a networking tool for young people looking to network with like-minded people and also The University of Maryland Baltimore County’s ACTiVATE initiative targeted at female entrepreneurs who are providing a year’s support along with sound guidance depending on the idea each is working on. The State ranks no.3 at Innovation and Entrepreneurship, 2nd at Talent Pipeline and no. 5 at the high-tech performance. Dallas is a haven for all alike – with decent salaries, reasonable home prices in addition to the complete absence of individual income tax or corporate income tax. Haven, indeed! As previously mentioned for Austin, Dallas substantially contributes to the 2.2 million number of small businesses, most in the sector of technology, financial services, and defense. The Dallas or the Fort Worth Area attracts the most number of investments into all sorts of industries and small businesses. 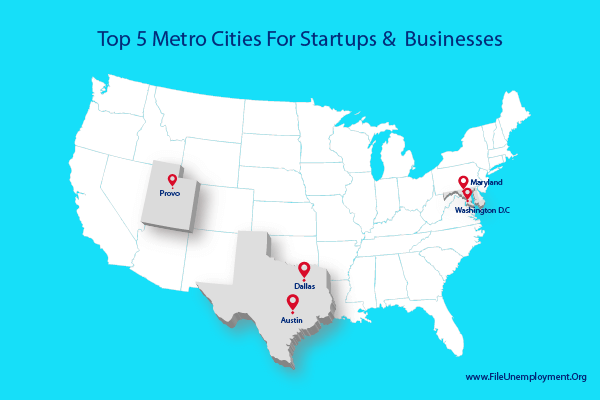 With unemployment rates far below the national average at 3.7% and a whopping collection of $104 million from startups in the first quarter of 2016, Dallas has by far simplified most problems encountered by entrepreneurs at the inception of a business enterprise. Ironic as it sounds, California, the home to the Silicon valley has dropped in its rankings far more drastically than you would expect. Cities are nothing short of dynamic breeding houses for entrepreneurs, which inevitably leads to social changes anyone normally wouldn’t expect. And as a result of this dynamicity, the governance change, the attitude to business enterprises change. A developing (as opposed to a developed) city now provides more promises for a small business to thrive as the laws in the state are flexible enough to attract more people who could innovate and fill-up existing voids in the market. The findings of the United States Small Business Friendliness Survey, which has been conducted consecutively for the past five years reinforces this fact by placing California in one of the lowest ranks. California may now be a bad place to set up a new business altogether, however, if you are one looking for a new job, California may not be a bad place. For information on unemployment benefits, use our benefits calculator stacked along with eligibility requirements to know more. Searching for the perfect city isn’t easy when you will have to scout for the cheapest labor along with governments which connect the unemployed populace with the job-creators. This requires a synergy between the labor and the business sector which we can vouch for in the above cities. We hope this article has burst the myths surrounding what makes businesses tick! Sometimes you may have the best of ideas to enforce, but are lacking a great team, a government that doesn’t support or a dearth of capital – so businesses are not all about ideas but are also about other factors, social, economic and most of all what we’ve been trying to prove, the city itself. You’ve got an idea, now make the search for the perfect city a priority!